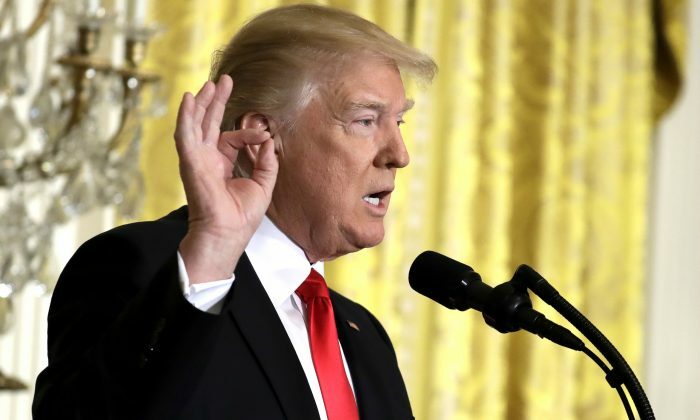 A new poll has found that President Donald Trump’s approval rating increased and has remained constant this week. Rasmussen Reports, in its daily tracking poll on Thursday, found that 55 percent of likely voters in the United States approve of the job Trump is doing. The poll found that 45 percent of voters disapprove. Meanwhile, 39 percent of likely voters “strongly approve” and 37 percent “strongly disapprove” in the job Trump is doing, the poll noted. The poll, which has a 2.5 percent margin of error and a 95 percent level of confidence, comes as Trump assailed CNN and other mainstream media outlets. In an exchange with CNN reporter Jim Acosta, Trump said he came up with a new term, “very fake news,” to describe the news outlet and other outlets that he believes as being biased against his administration. “I love this. I’m having a good time,” the president also said at his latest press conference, according to a live stream. “I want to see an honest press. … It’s so important to the public. The public doesn’t believe you people anymore,” said Trump. “They’ll take this news conference—I’m actually having a very good time—but they’ll take this news conference … That’s how I won. I won with news conferences and speeches. I certainly didn’t win with you people, that’s for sure. But I am having a good time. Tomorrow you will say: Donald Trump rants and raves,” he added. Trump’s administration was seen as being more truthful than the media, according to a poll conducted in early February. Emerson College discovered that 49 percent of respondents consider Trump’s administration truthful, while it found that 53 percent believe the news media is untruthful.